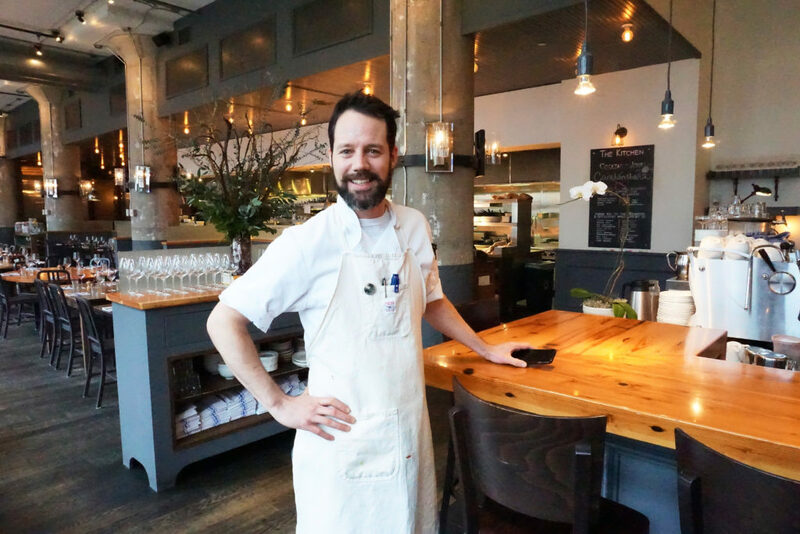 Johnny Anderes is head chef of The Kitchen Chicago, with a beautiful location overlooking the north bank of the Chicago River. 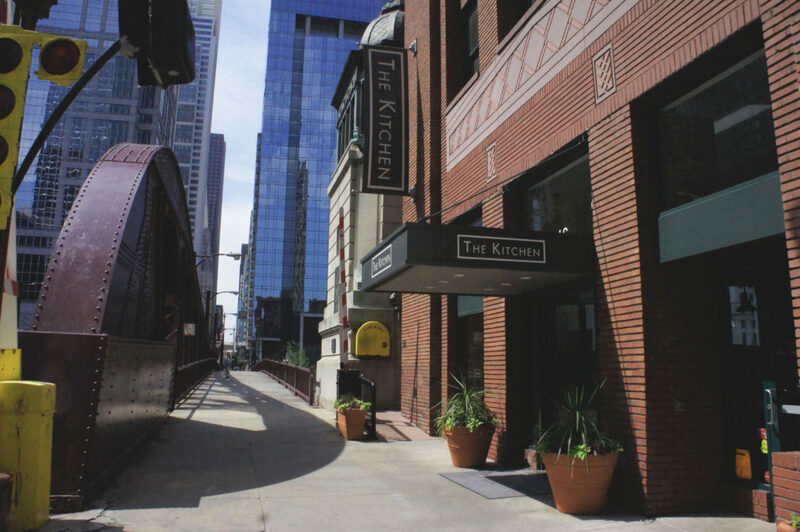 The Kitchen restaurant group was founded in Boulder, Colorado in 2004 and features delicious food — with a strong focus on local and sustainable sourcing — at its restaurants in Colorado, Chicago and Memphis. And The Kitchen, founded by entrepreneur Kimbal Musk and his partners Hugo Matheson and Jen Lewin, goes beyond the core Good Food principles with its strong social mission. The Kitchen Community, a 501(c)(3) nonprofit adjunct to the restaurant group, has since 2011 built learning gardens at schools in the cities where it has operations. With a goal “to connect kids with Real Food,” The Kitchen Community has created more than 200 school gardens over the past six years. A native of Minneapolis, Johnny Anderes says his interest in cooking was inspired by his food-centric family. He moved to Chicago in 2004, and the die was cast for him to pursue a career cooking with locally and sustainably produced ingredients: He worked for six years at Avec, one of the restaurants created by Chef Paul Kahan — a sustainability leader in Chicago’s culinary community — and his partners at the One Off Hospitality Group. Johnny proceeded to open two restaurants in the Logan Square neighborhood — Reno, a casual eatery featuring wood-baked pizza and bagels, and Telegraph, a biodynamic wine bar that is now closed — before taking a break to tour his wife’s home state of New York. It was during that break that Musk contacted him to see if he would be interested in heading The Kitchen at its new Chicago location. Johnny promptly agreed to take the job, and has been at it since 2014. 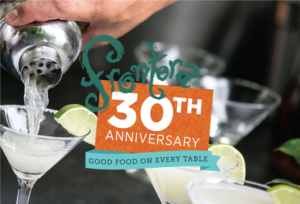 On Sunday, April 30, Johnny will join Paul Kahan and an all-star lineup of chefs who are participating in the Frontera 30th Anniversary Celebration, a joint fundraiser for Chef Rick Bayless‘ Frontera Farmer Foundation and FamilyFarmed, which will be held at The Art Institute of Chicago on Sunday, April 30. Please enjoy the following excepted interview between FamilyFarmed and Johnny Anderes focused on the opportunities and challenges for restaurants sourcing locally and sustainably produced ingredients. FamilyFarmed: What have been the most significant changes that you’ve seen that have changed in a more local, sustainable direction? Johnny: The biggest thing I’ve seen change is distribution… We get different distributors coming in here, they are able to supply us with organic farm ingredients pretty much all year round. Which never was the case before, and you would really have to go on a scavenger hunt. Now the scavenger hunt kind of is where to get the deals, where to try make up some compensation in the off-season with shipping. … So the whole scene has just blown up on the distribution end in the past 10-plus years. FamilyFarmed: At our Good Food Festival, we had a panel that explored the idea “Does Good Food Need to Be Local?” I think we’ve seen an evolution where Good Food and local food used to be kind of synonymous in the minds of people in the movement, but now because so many restaurants, so many groceries and so many consumers are seeking quality foods, and location is a bit less vital. Johnny: Local food 10, 15 years ago sounded kind of like crunchy or hippie, and now it’s more about consistency and quality, for sure. FamilyFarmed: There was a time when there was very high-end fine dining and then there was neighborhood, deli, ethnic, small basement kind of places. Over the past 10, 20 years, what you do, what many chefs do today, is a middle ground, there’s lot of opportunity and a customer base that’s looking for chef-driven food. Johnny: Exactly. It’s everywhere, at least in this city and most major cities, is the in-between ground. It’s a battle out there too because there’s a lot of chefs and a lot of restaurants, and how do you separate yourself, or do you separate yourself. At least here, we’re never going to be the most cutting-edge dining experience within our group. We’re shooting for consistency and treating our employees really well and trying to be a bigger part of a distribution network across the Midwest. FamilyFarmed: That good worker environment is really starting to get attention. It’s becoming a major issue. Johnny: I think we do a really good job because we wouldn’t like to be considered a chain but we definitely are able to give our employees some really nice benefits that just don’t exist in the independent restaurant world. That being said, good food, good people, all kind of coincides. 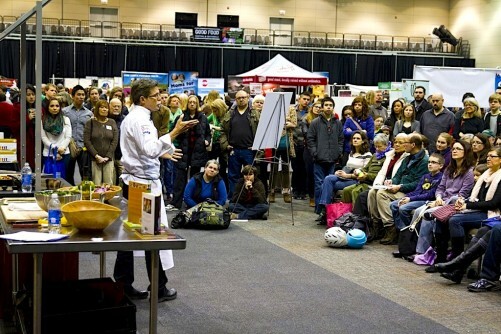 FamilyFarmed: The Kitchen has the broader mission of The Kitchen Community. Johnny: It will be interesting to see what we pick up from those guys this year. Last year was good. I think we purchased about $5,000 worth of vegetables and herbs from them. It was cool. This year we’re hoping to have more and move forward with that whole situation. FamilyFarmed: How about your customers? Is it the fact that you provide a small-g good food experience, or do they come here because they’re looking for the whole package, Good Food, local, sustainable? Johnny: I think people come here looking for a consistent product and a consistent package. Fine service, good food. The food, when I’m going out to eat in some of these places, I’m more looking at that as part of a total experience. Rather than just coming here for the food, people this day and age they want the whole package. Which makes sense. They want a nice place where they can do some work, have a date, have a lunch meeting, do the whole thing. FamilyFarmed: What are some of the things you’ve added to the menu or products that you’ve seen come along that were exciting? Johnny: Exciting products is being able to get a good healthy line of lettuce greens in consistently from a couple of different farmers through Local Foods. We brought in literally a ton, a palette ton of sustainable raised white sturgeon that he had on the menu for five months from Tsar Nicoulai in Idaho… And then having a really low turnover this year for employees has been great. A lot of places are really scrapping to get cooks in the door. People aren’t leaving, they enjoy it here, they believe they are being treated fair. That’s been really rewarding. Johnny: It can’t be, because guess what, it’s really expensive. Food’s really expensive. That’s why you see a lot of this type of dining that’s so popular, because if you’re getting a really nice piece of halibut that’s from a sustainable fishery in Alaska, it’s not cheap. People’s expectations that are value-driven is always something that we talk about. When you’re doing less to that, it’s making it so we can give it to you at a price that’s not going to seem ridiculous. Johnny: Exactly. It’s not uncommon now for people to be paying 30+ dollars for a fish dish. One thing we do very well here is we’re giving you a very healthy portion of fish. By not doing a whole lot to it keeps the price down. 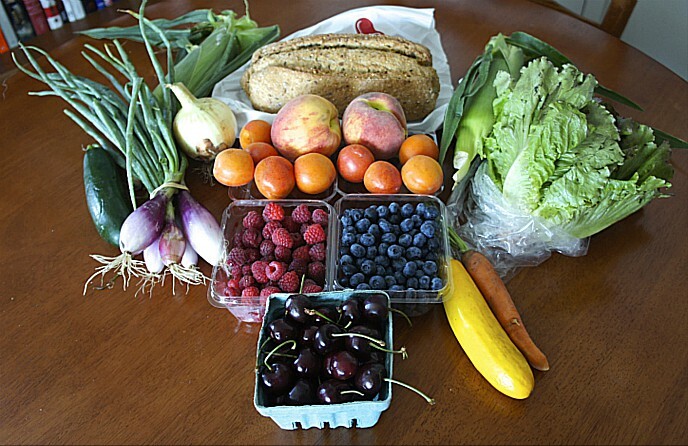 FamilyFarmed: You talked about going to the farmers market and foraging there. How do you forage on the larger scale? Johnny: It’s foraging relationships. Tsar Nicoulai, we were getting caviar from them. I just asked them what they were doing with their fleet of sturgeon after they use them for caviar. He said, We smoke some and we sell off some. How much would you sell me all your sturgeon for? They gave me a price and we negotiated. It works out for them, it works out for us, and we’re able to cold-store that locally here. Whenever we’re not doing local foods, it’s always relationship-driven. They share the same ideology that we do. Easy-peasy. FamilyFarmed: That also addresses our universal problem of food waste. Any other things that have come up in that vein? Johnny: The type of thing with trash fish. We’ve been putting the invasive blue catfish on the menu when the weather’s a little bit nicer. People actually buy that here. I brought in a bunch, and it’s easy for us, the price is right, and man, we sold a lot of catfish here. I’m really surprised. 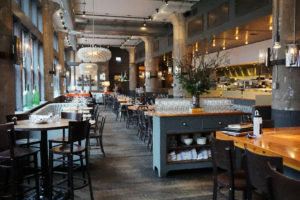 FamilyFarmed: Let’s talk a little bit about Rick Bayless’ influence on the Chicago restaurant scene. I was always cooking for him at Avec, and then when I first moved here, my brother was always asking me about Rick, he had just bought his cookbook and he was getting his doctorate at the University of Chicago. And I said, Yeah, Rick’s great, you should definitely be cooking out of that book. He’s really been one of those constants in the Chicago food scene. FamilyFarmed: One of the things I love about cookbooks by people like Rick…is that it’s uncomplicated… Home cooking can and should be easy…. Clean good food on the plate. The ingredients just speak for themselves. This entry was posted in Chef advocacy, Farm to table dining, Farm to Table: Keeping It Real, Food activism, Frontera 30th Anniversary Celebration, Frontera Farmer Foundation, Good Food Dining, Good Food Festivals, Good Food restaurant trends, Local Food, Logistics, Restaurants and Good Food, Supply chain, Sustainable dining and tagged Avec restaurant, Chef Paul Kahan, Chef Rick Bayless, Erling Wu-Bower, FamilyFarmed, Farm to Table: Keeping It Real, Frontera 30th Anniversary Celebration, Frontera Farmer Foundation, Frontera Grill, Good Food Festival & Conference, Julia Child, Local Foods Chicago, One Off Hospitality, The Kitchen Community, The Kitchen restaurant group, Tsar Nicoulai. Bookmark the permalink. I just loved that article, clean, cool and unmolested food!